The 2018 edition of the Ram ProMaster was made to get deliveries done efficiently regardless of the tight spaces and difficult traffic that's typical of today's urban roadways. Whether its backing up to loading docks or parking on busy commercial district streets, the Ram ProMaster has the power and maneuverability needed for courier work. 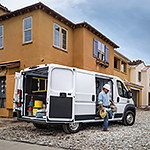 The Ram ProMaster is a front-wheel drive van with a tight 36-foot turning diameter for maneuvering in narrow alleys. It's powered by the 3.6L PentaStar V6 engine, which provides 280 horsepower for quick acceleration while carrying full payloads. With that much horsepower, it can tow up to 2,313 kg and carry a payload of over 2,363 kg. The PentaStar engine is mated to the six-speed 62TE transmission, which offers smooth shifting between gears and efficient operation. It's specially enhanced for the Ram ProMaster's intended driving conditions as a delivery van.